At the restaurant, waist-high robots with two eyes and a smile permanently fixed on their faces guide patrons to empty seats. Guests order food using an iPad and a different style of robot zooms between the kitchen and tables, bringing guests rolls, nigiri and other items. It might utter "excuse me" when it slips past a human body or "enjoy your meal" to diners about to eat. So far, a restaurant is yet to purchase a service robot from Autonetics, he said. 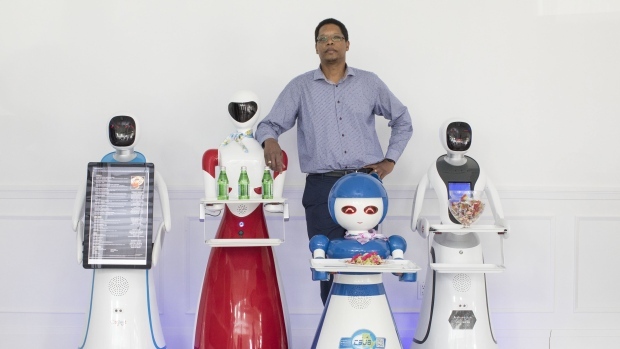 But he believes it won't be long before one of his robots is greeting customers, taking orders or serving guests in a Canadian restaurant -- though he said he can't put a date on it. He noted Canada is fairly new to incorporating robotics into retail, whereas he finds it's more common in other countries. Part of the hesitation could come from sticker shock as money is the first factor Jiang points to as a reason more restaurants don't deploy robots. McGowan said the service robots Autonetics sells run from about $7,000 to $25,000 or higher, depending on what additional parts a buyer wants. Some initial support is included, but beyond that repairs and training are extra. However, he believes restaurateurs may also be slow to add robot staff because no one's brought the product to market in Canada yet. McGowan is trying to bring businesses on board by showing them the benefits of automation. "I can see them lowering some labour costs," he said, making sure to highlight that it also creates jobs in technology. "No shortage of: 'You guys are the coolest thing in the show,"' he said. McGowan also expects holograms -- three-dimensional videos that don't require any special glasses or technology to view -- will soon be in more eateries as the technology sells itself and lures customers in. He recently sold one to a coffee shop, which might use it to display coffee being poured into a cup, for example.